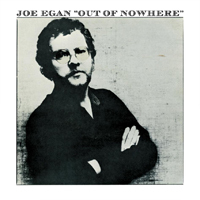 JOE EGAN shot to fame as partner with Gerry Rafferty in STEALERS WHEEL and jointly wrote “Stuck In The Middle With You” as well as writing “Star”. The band broke up in 1975 and he commenced work on his solo album “Out Of Nowhere” which was not released until 1979 because he was contractually not obliged to release any recordings for three years after Stealers Wheel split up. “Out Of Nowhere” was produced by Grammy nominated songwriter and producer DAVID COURTNEY who said: “The album reflected where Joe was at this time of life and career following on from his split with Gerry Rafferty which I felt was evident in some of his lyrics. Joe was a dream artist to produce”. A classic album now available for the first time on CD. Out Of Nowhere was produced by David Courtney, who also produced Leo Sayer, Roger Daltrey and Adam Faith. He is quoted as saying "The album reflected where Joe was at this time of life and career following on from his split with Gerry Rafferty which I felt was evident in some of his lyrics". I can only agree after listening to such songs as 'Ask No Favours', 'Why Let It Bother You', 'The Last Farewell', 'No Time For Sorrow', and 'Leaving It All Behind'. With some of the less than stellar albums that have been given copious reassessments and reissues over the years, it really is amazing that an album this good has sat on the shelf for more than three and a half decades. Credit to Angel Air Records and Joe Egan for righting that wrong. With interesting liner notes from Egan's brother Kevin, comments from the album producer David Courtney (who did a great job of capturing the relaxed vibe, yet making it sound vibrant) and a full set of lyrics, Out Of Nowhere really is an excellent re-release. Hopefully Map is next, however even more interestingly, the liner notes also hint at other previously unreleased Egan recordings seeing the light of day. Until then, get set to welcome Out Of Nowhere in from the cold. It'll warm your heart if you do. Up until now Out of Nowhere was only available on vinyl. The years have been kind to this album. Thanks to producer David Courtney and Angel Air's Peter Purnell, Egan's long lost album can once again be heard by old fans as well as an entirely new audience. Today these songs would fit somewhere in the folk/pop/Americana genres. What impresses us most about these tracks is the fact that they don't sound the least bit dated. Joe wrote some great songs for this album that surely should have received more attention than they did when originally released. Hopefully this Angel Air release will bring this album to the attention of a much larger audience...The accompanying booklet offers notes from Egan's younger brother Kevin as well as David Courtney. Top notch stuff, recommended. Top pick. ...the songs ooze an understated joy drenched in sensual orchestration yet leaning towards country-rock's wind of adventure - full of soft harmonies, 'Freeze' wouldn't sound out of place on an EAGLES record - so there's a nice balance between delicate pining of 'Natural High' and the communal delight of 'The Last Farewell' where Gallagher and Lyle join in. But while a vaudeville whiff in 'Ask For No Favours' and the bluesy call-and-response in 'Pride' bridge this gap with a mischievous smile, 'Why Let It Bother You' wraps a worry into a sweet skank, and 'No Time For Sorrow' dries any occasional tear which fogs Egan's eyes. Still, it's 'Leaving It All Behind' that rocks with a righteous resolution and arresting abandon, as befits an artist who's just cut loose and is having the time of his life. It's a fine piece of work, occupying much the same musical territory as Rafferty's 'Night Owl' and blessed with a clutch of subtly memorable tracks led by 'Back On The Road', 'Why Let It Bother You' and 'The Last Farewell'. With interesting liner notes from Egan's brother Kevin, comments from the album producer David Courtney (who did a great job of capturing the relaxed vibe, yet making it sound vibrant) and a full set of lyrics, Out Of Nowhere really is an excellent re-release. Hopefully Map is next, however even more interestingly, the liner notes also hint at other previously unreleased Egan recordings seeing the light of day. Until then, get set to welcome Out Of Nowhere in from the cold. It'll warm your heart if you do.